Today I visited the Virtual World Seminar at the University of Delft and finally had time to sit down and talk with Popke Rein Munniksma, the team leader of ABN's 3D Experience and with Emmanuel Gruijs, CEO for Active Worlds Europe. In the past week we have had some contact on the blog ING and ABN flee Second Life which caused a little stir in the blogosphere. "Maybe it has something to do with the company being taken over by Fortis." Although the future isn't certain this has been denied completely. The takeover is not affecting ABN's presence in any way at this point in time. 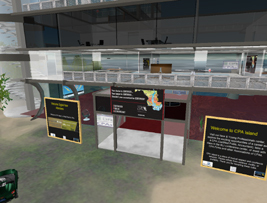 ABN is sticking in Second Life, but is indeed shifting focus to be able to do real business. Popke Rein said: "As a bank we have the need to have 1 on 1 contact with our customers behind closed doors." By being a bank ABN is bound to very strict privacy and compliancy rules which make it impossible for them to conduct business in Second Life, hence their move towards Active Worlds. In December 2006 ABN Amro was the first European bank to enter Second Life and rode the wave of mass media attention perfectly. They primarily entered with a "just do it" mentality. Their initial 4 islands and offices have grown towards a 27 island presence at it's peak, but is being downsized now. A team of 4 full time employees on average has build and rebuild every experience over and over again, mainly based on user feedback (so I'm estimating a budget of close to 1 million euro). 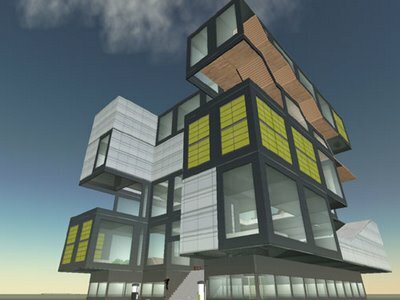 Every build was an experiment to see to which part of the Bank's business they could find a virtual extention as they are convinced that Virtual Worlds are here to stay. in it," in 1993! That won't happen to ABN when it comes to virtual worlds. Every step the team made had to be checked with risk management and compliancy and other regulatory organs within the bank. We cannot afford to do that, go through that whole process, once virtual worlds become mainstream. Then it's too late." 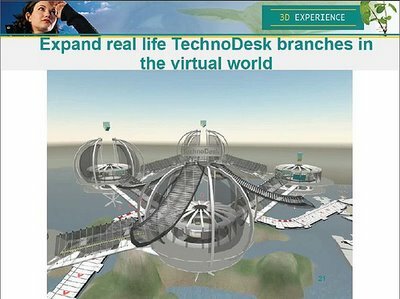 That process of going through regulatory motions has become quite clear in their TechnoDesk and Tradeglobe sims in Second Life. In Real Life ABN has 5 TechnoDesk offices close to the 5 Technical Universities in the Netherlands. In these offices the bank offers information for High Tech startups and when looking at the population of Second Life, this was their logical 6th office. 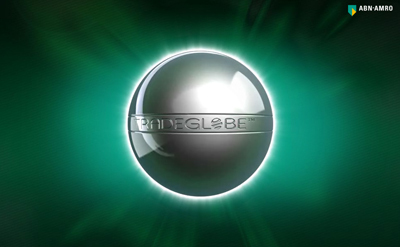 The TradeGlobe is ABN's private banking vehicle with which they come into contact with their shamingly rich clients. In Second Life they've held investment meetings and so on. Over the past year, the ABN greeter, the lovely Mrs. Jung, has had over 1.100 real business conversations with interested customers, which is more than the average local bankemployee has. In this regard, Second Life has been a success for the bank. However, due to privacy rulings they found they would never be able to achieve one on one advice and were limited to general information only. Because of it's conservative nature and regulations the bank needs a secure environment to conduct one on one business. Active Worlds can offer this, said Emmanuel Gruijs on the growing affection between their world and the Dutch banker. Popke Rein said: "Remember who said "The internet, we are not interested in it," in 1993! Read full article here at Virtually Blind. Late last night the infamous Prokofy Neva posted a mega post over at Second Thoughts over an intervention Linden Lab performed. This is bound to create another stir in the community. "Land bought in Furness next door to me in Ravenglass for the sole purpose of harassing me and my tenants has been confiscated by LL, in a move which some might find as suspect and controversial, but others might see as part of a growing willingness by Linden Lab to leave their hippie anarcho-capitalist technolibertarian days, and become a more established business determined to make a grid viable for civil society online." "For once, they've (LL) responded within 24 hours, and responded very decisively in a way which is sure to raise controversy..."
Because of Prokofy Neva's reputation it didn't take long for the first insinuating posts have started to appear on the Second Life Herald and Your2ndPlace. The SLH speculates in FIC Tables Turned - Ex-Critic Crows About LL Land Seizure that Prokofy apparantly has some tie-ins with Linden Lab and thus becoming part of the FIC (Feted Inner Core -- the group of alledged Linden Lab adorers which receive friendly favors of the powers that be) Prokofy has so assidiously fought over the past year. then Shaun Altman is a liar - as are a few other people I have communicated with. And if she said it and actually had something to do with it, well, the latter would explain why Prokofy Neva has lead such a charmed Second Life." "Prokofy Neva went on to inform me that the avatar who purchased this land had been banned from Second Life, after the seizure of the avatar's property (land) by Linden Lab. He then asked me a very chilling question. I didn't log it, so I can't quote it verbatim, but it was directly along the lines of, "Do you see what I can get done if I want to?". "Do you see what I can get done if I want to?". "I didn't log it, so I can't quote it verbatim,"
There have been suspicious activities at Woodbury in the past. Evidence seems solid enough to justify the removal of the sim from a legal point of view when looking at the ToC. Where possible, action should be undertaken against griefers. Although they can perform very little actual damage, they are a threat. They will hamper growth in qunatity as well as quality. I personally it is a bit overdone to call the whole scene a "Woodbury Conspiracy", but I can imagine griefers not being happy over expulsion and stalking the person responsible for their exposure. Based upon Prokofy Neva's narrative of the situation, Linden Lab has taken a rightfull decision. When this is going to cause havok, I hope LL does have some unbiased evidence to support their case. "Do you see what I can get done if I want to?" is an interesting line. I do have some thoughts there, but won't articulate them yet as they are thoughts, not facts. The dust seems to have settled on Linden Labs recent 'Banning of Banking Activities'. A long overdue statement by Linden Labs who have taken a stance against malicious scammers, some who have managed to acquire over 700.000USD in two to three years. Several banks have protested, as well as several clients and residents. Casualties of this decision by claiming to do fair and honest business, or just general concern to get their money back. But what caused the most controversy in my opinion is the fact Linden Labs seems to have acted as a 'Network Overlord', ruling law between citizen disputes. In earlier 'bannings' many felt Linden Labs hand was forced by long existing, international real world laws, such as the gambling policy and the stance against 'ageplay'. Dramatic extrapolations of this decision to ban banking speak of moral policing, where Linden Labs as owner of Second Life begins to seriously force their own values on their users resulting in the following question: Is Linden Labs policing citizens, interfering with things that aren't their concern in the spirit of free economy? Just because the residents of Second Life pay money for their virtual 'credits' doesn't make in real money. You won't be able to exchange it outside the realm of Second Life, or Second Life related websites, its value is bound to the laws of its software (or rather its popularity), and it has a lot more flexibility than a real currency. But the Linden Dollar has more resemblance to real currency than any other 'gaming money'. It can be bought and redeemed at variable costs, based on supply and demand. There is an overseeing institution and it can buy services, even products not related to the software (Second Life) itself. But even though the Linden Dollar has some properties to qualify for a real currency - its not in the eyes of the current juridical system. So why then, would Linden Labs be afraid of lawsuits resulting in scams based on this 'play money'? As Rheta states in the comments - Couldn't Linden Labs easily claim "banking is a game activity like any other, and that losses are no more prosecutable than losing a fight in Counterstrike?" Even if the Linden Dollar is just 'Virtual property' instead of real money it doesn't put Linden Labs (or its users) in the clear. In the Netherlands a group of teenagers recently got arrested for 'Virtual Theft'. In the virtual chatbox Habbo Hotel they scammed furniture out of the account of several other players. Habbo Hotel works a bit different in the way that teenagers pay Habbo Hotel in order to get their 'online credits' - credit cost US$5.25 per 25 Habbo Credits. The players (mostly teens) are able to buy furniture of the Habbo Hotel owner, the Sulake Corporation - and only of the Sulake Corporation - to increase their status within the community by 'pimping' their rooms. This furniture can then only be traded, and Habbo Credits can not be changed back into real dollars. But what the Habbo incident has proven is - at least in the Netherlands - Virtual Property has juridical value. It can be stolen, and the thieves can be held responsible for real life laws. In October 2007 a bank collapsed with estimated assets of over 700.000USD, the Habbo Hotel thief stole furniture worth about 4.000 Euro. Linden Labs new policy is only a confirmation of what can only be the logical conclusion to a fact real life laws have yet to catch up on in meatspace. The Linden Dollar is real money, real property, and stealing it is real theft. Not part of the gaming process. So to answer the question "Is Linden Labs policing citizens, interfering with things that aren't their concern in the spirit of free economy?" - No they are not. The banning of banking activities was a preventive strike at what could be a major problem for the Virtual World in the near future. Linden Labs has declared their money 'real'. Real money, real scams, real crimes, and by doing so they have paved the way for the continued development of Second Life as a serious Business Platform. It fits perfectly in the line of banning gambling and 'ageplay' because of international law, it's just Linden Labs struck first this time instead of waiting for yet another media outrage. Disclaimer: This was a guest publication by Rick van der Wal (Digado). My views may not necessarily represent those of Veejay Burns, main author of this blog. It's time you kept your records straight. Have pen and pencil ready at your virtual counter to register every sold hair-extention. Actually, your transaction history doesn't last long. 5 days at the moment, so you can fool your accountant every week. 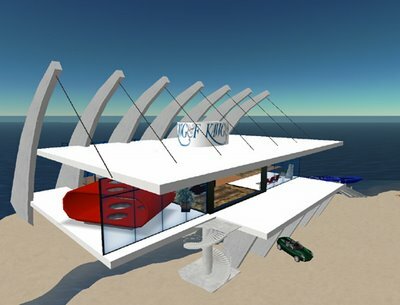 Accountants being as they are don't like that and are coming to Second Life to poke around your virtual proceedings. "Not only a new world is created, but a complete economy with new business models. Accountants need to get into these developments or run the risk of being out of business"
"There are people that still consider Second Life as a hype, but it looks like they are proven wrong, just like the internet-sceptics 15 years ago. This kind of virtual worlds is rapidly developing not only in technological and graphical but also in economic ways." Price Waterhouse Coopers is looking into al sorts of legal and financial aspects of Second Life and also the Congressional US Joint Economic Comittee will come forth with a study on the fiscal issues in "virtual worlds such as Second Life and World of Warcraft"
The first two pictures are of the CPA Island (Certified Public Accountants) founded by the MACPA, the Maryland Association for CPA's of which the first image is the virtual office of the KAWG&F , a large Maryland based CPA frim which immersed in Februari 2007. 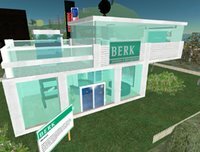 The last image is that of Berk Accountants, a Dutch accountancy firm, also present in Second Life since februari 2007. The Dutch accountants primarily focus on getting in touch with Young Professionals. Hans Koning, Managing partner of Berk says “Our branche is a relatively closed world, while our future colleagues are used to much more openess through the internet. We try to anticipate in this." In a week that most citizens are getting annoyed over the SLCC code of conduct, Linden Labs themselves are working hard on Legal suits. 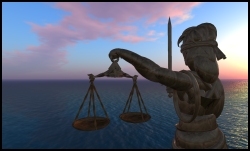 Reuters reports that a French court dismissed a complaint against Linden Lab on Tuesday that was filed by a French group opposed to adult content within the virtual world. "Though there's no mention of any kind of legal document to support it, and the information is coming from a third party, it does appear at least that Coca Cola, who's virtual thirst campaign in Second Life asks residents to create a vending experience in the virtual world that captures the "spirit" of the brand, have released their trademark to residents. My friend Vint Falken reports that she received the following message from SLX, a web based shopping engine for the Second Life: "We have spoken to Coca-Cola and they have released their trademark to SL Merchants. Therefore, any of your items that were disabled on June 7, 2007 have been retrieved….". The email was in follow up to a take down of a "coke suit" Vint had made and put up for sale on the site." Once again this proves that Second Life has a strong impact in the world of big business. The Coca Cola company has been untouchable in the Real World, but it seems they have to follow the laws laid out in Second Life as well. This might be a very interesting case-study for business-law and Intellectual Property. 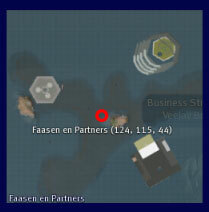 A while ago I stumbled on the (blocked) island of Dutch Lawfrim Faassen & Partners. Every once in a while I scan my list of sims under construction and try which ones are open. Last week I tried FP again, to no success. Now it's open though, and I had to find out reading it at 3pointD in an article by my good friend Aleister. I won't get into too much detail of the firm, as I already did a little PR for them in this post. The build is refreshing in style with a great detail in texturing. The firms main (virtual) office is at the sims center, with small info-islands and an auditorium scattered around in the ocean. Sailboats can take you 'to and fro' the various stops on the island. As Aleister duly noted is that this sims freebee set is a scuba-kit, a nice change from the endless sets of t-shirts that are usually thrown in. Shortly after the Second Life seminar at Media Plaza, earlier this month, I visited the virtual campus of the Vrije Universiteit Amsterdam. The sim was build in just a couple of weeks by a team of 4 students. The main structure is quite similar to the Real Life campus, but the college room hovering at an altidtude of 10 m. certainly is not. The classroom is used for actuall classes. One of the courses given in SL is Law, which is a real happening. Groups of students observe (odd and frequent indecent) behaviour in SL and describe the legal implications of the observed actions.